WASHINGTON (March 03, 2009) -- The Army should be focusing on three key areas in the short term said the service's vice chief of staff. During the Association of the United States Army's Institute of Land Warfare Winter Symposium and Exposition, Feb. 25-27, in Fort Lauderdale, Fla., Gen. Peter W. Chiarelli said the Army should focus on connectivity, commonality and survivability. 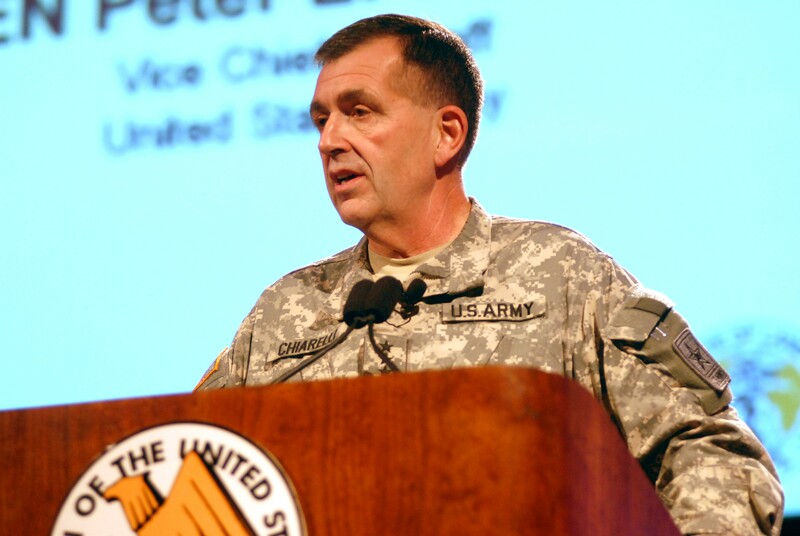 During the Association of the United States Army's Institute of Land Warfare Winter Symposium and Exposition, Feb. 25-27, in Fort Lauderdale, Fla., Vice Chief of Staff of the Army Gen. Peter W. Chiarelli said the Army should focus on connectivity, commonality and survivability. With the rise of the "strategic corporal" -- the junior noncommissioned officer that makes game-changing decisions in the field -- it is imperative that even the junior-most Soldier in the field have as much information as he needs to do his job, Chiarelli said. "Information is power, and we need to make sure we are pushing power down to the lowest levels on the battlefield, where it is most needed," he said. "It is no longer realistic to assume all or even the majority of game-changing decisions will be made at senior levels of command; to the contrary, those decisions are more often made by the individual Soldier on the ground. We are committed to the network and to networking every Soldier." Over the last few years the Army has developed new technology to help push more information to the Soldiers that need it most, the general said. In 2004, for instance, the 1st Cavalry Division deployed to Iraq with Command Post of the Future. "In one year, commanding a division in Baghdad, because of CPOF, there was not a single time that I called a brigade commander to my command post to issue an operations order," Chiarelli said. "We did it all over the collaboration network of CPOF." The Tactical Ground Reporting System is also empowering Soldiers, according to the vice chief of staff. The TIGR is a multimedia system for Soldiers at platoon level and allows for sharing information such as digital photos, voice recordings and GPS tracking. The TIGR is now arming Soldiers from 17 combat brigades in Iraq and Afghanistan with the information they need to do their jobs, Chiarelli said. Among combat systems, a lack of commonality causes problems for the Army, Chiarelli said. "You can look at five different vehicles and find five different chassis, engines, drive trains -- you name it," he said. The result of that is increased cost and a "heavier load" across the force. "If you want to see something that affects deployability, look at our lack of commonality." But in some systems, the Army has reaped the benefits of commonality. One such system is the Stryker family of vehicles, which includes about 10 vehicles in all. Some of those vehicles include the Mobile Gun System, the Reconnaissance Vehicle, the Fire Support Vehicle and the NBC Reconnaissance Vehicle. Each of the 10 vehicles in the Stryker family is built on a common platform and shares common parts. "This basic commonality has significantly enhanced the efficiency and effectiveness of the overall system," he said. When certain parts of a combat vehicle break, the vehicle can be marked "deadlined," meaning it is not available for Soldiers to use. But some 70 percent of the parts that could deadline a Stryker vehicle are common across the family of vehicles. Because of that commonality, if a part must be replaced on one Stryker vehicle, the chances of it being available locally are greatly improved -- meaning vehicle mechanics don't have to wait for a part to come in. "This has greatly reduced both cost and wait time for units on the ground," Chiarelli said. "Stryker has provided a great model for how we might further increase commonality across areas in the Army." The general said that Stryker is just one great example of how commonality has improved efficiency for the Army. Another example, he said, is the Future Combat Systems family of vehicles. Those eight vehicles will share even greater commonality than the Stryker. Protecting Soldiers -- providing survivability -- is also a priority for the Army, Chiarelli said. "It's easy to make a case for deployability on this side of the next war; however, once the next war begins, survivability will arguably become an even bigger priority," he said. "In the near term we must ensure we are not sacrificing one in the fervent pursuit of the other." The general said he recently spent time at the Army research labs at Aberdeen Proving Ground, Md. There, the Army is researching the next generation of armor. "I saw incredible armor protection technology currently under development," he said. "And I am truly amazed at all that has been accomplished in recent years and promises to be accomplished in the future to improve survivability on the battlefield." Survivability is critical across the Army, and the service has learned "important lessons" about the value of protection while fighting the war on terror in both Iraq and Afghanistan. The promise of better survivability increases both the confidence and capability of Soldiers, Chiarelli said. One sign of the Army's commitment to providing survivability to Soldiers is the success of the Mine Resistant Ambush Protected vehicle. Last week, the general said, the 10,000th MRAP in theater arrived at Camp Liberty in Iraq. "In less than two years, this vehicle has saved an untold number of arms, legs and lives," he added. The general also emphasized that while he is in support of a deployable force, he doesn't believe that expeditionary quality should come at the cost of protecting the lives of Soldiers. "Let there be no doubt, I am for a deployable and expeditionary force -- but I cannot in good conscious sacrifice the incredible advantage we have made in passive protection material and composites -- advantages that have allowed our Soldiers to walk away from the effects of the (explosively formed penetrators) hidden in trashcans in downtown Baghdad, or an (improvised explosive device) buried under a road in Afghanistan," he said. The general also said that in modern warfare, active protection systems must be built. But those systems, he said, must be in addition to, not in lieu of, the best passive protection systems that can be provided to Soldiers.